You’ve been looking forward to it all dreary winter and now the time has come to open your cabin for the spring and summer! Follow these insights to get your lake home in peak warm-weather condition, while still leaving time to enjoy those first perfect weeks of cabin season. Call to turn on any services you shut off over the winter, including electricity, water and trash collection. Check the insurance policies on your lake home and boat. Contact Edina Realty Insurance if you’ve purchased a new jet ski, boat or wave runner that you’d like to insure. Check your boating registration and renew it if necessary. In Minnesota and Wisconsin, watercraft licenses must be renewed every three years. If you plan to put in a dock, and you need help, call your crew a few weeks in advance to see if they’re available. After a long winter away, you’ll need to be sure that your home is safe to inhabit again before you turn on your water and other systems. Check the furnace and put in a new filter. Check pipes for rust or damage before you turn on your plumbing and water heater. If you’re not sure how to make the call, hire a plumber to do a basic assessment. Be on the lookout for signs of critters. Check screens and windows for holes and gaps and electrical cords for fraying or bite marks. Inspect your deck and eaves for signs of rotting. Test the batteries in your smoke and carbon monoxide detectors. Test and replace the batteries in motion sensor lights on the front door, deck and on the way down to the lake. 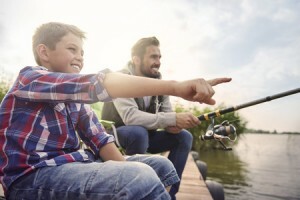 Whether you’ll spend the whole summer or special weekends at your lake home, you’ll want to be sure it’s stocked with the basics. Run a quick inventory review before heading to the store for replenishments. Go through your pantry and throw out any expired food, as well as anything that looks like it may have been the subject of a critter invasion. Check that you’re stocked up on sunscreen and bug spray. Remember that sunscreen lasts at its original potency for up to three years. If you’re not sure when your bottles were purchased, buy a new set and label the purchase date so you can avoid tossing out bottles in the future. Check the stock of your bathroom toiletries. To save money and stay green buy shampoo, conditioner and body wash in bulk bottles rather than using travel samples. You’ll thank yourself next year when your organizational habits give you even more time on the lake on that first perfect cabin weekend. Hoping to buy a lake home this summer? Buyers don’t want to miss one day on the water, so the market is already heating up! Start by getting matched up with a REALTOR® who specializes in your desired lake home area. Call, email or chat our customer care team today to get started.